A teenage boy who was stabbed to death in south London on Monday has been named by police. 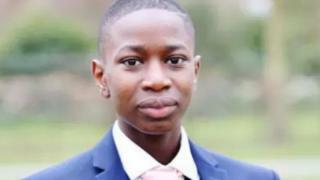 John Ogunjobi, 16, was found unconscious on Grenleaf Close, Tulse Hill at 22:53 GMT and died shortly after. A post-mortem examination held on Thursday gave the cause of death as a stab wound. No arrests have been made and enquiries are ongoing to establish whether a firearm was discharged, police said. Appealing for witnesses, Det Ch Insp Vandenbergh said: "We believe the victim was attacked by a number of suspects and the altercation would have undoubtedly drawn the attention of those who were in the vicinity." Mr Ogunjobi became the fifth person to be stabbed to death in London in a week of separate violent attacks.